In the autumn of 1961 I enrolled in the photography course at the Layton School of Art in Milwaukee. While my first visits to school were made by car from home in northern Illinois, it became obvious that the easiest way to get to and from Milwaukee would be by train through Chicago. And the options were enough to tempt any red-blooded railfan: Into Chicago on either the North Western out of Dixon or the Burlington out of Oregon (Indiana) and up to Milwaukee on the C&NW, Milwaukee Road or North Shore (not to mention one trip on the Soo Line to Waukesha and a most-inconvenient bus connection into Milwaukee). In spite of bilevel 400s and Hiawathas with full-length domes and “Skytop” observation cars, however, by far my favorite way to Chicago was the Chicago North Shore & Milwaukee. Samuel lnsull’s great interurban, though under constant threat of abandonment was still living out its glory years. 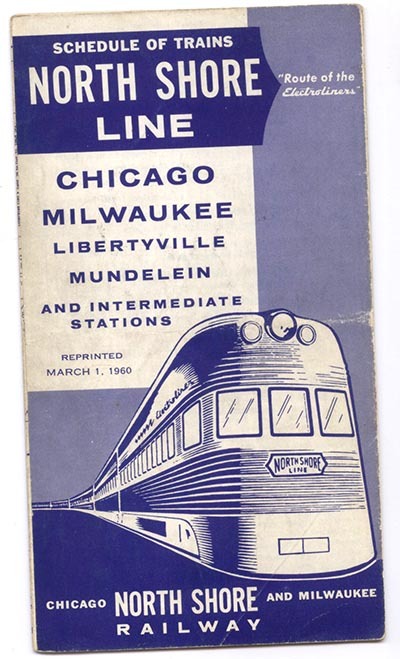 There was hourly service between Chicago and Milwaukee throughout the day, totaling 38 trains every 24 hours on schedules calling for over 2,000 daily miles logged at over 60 m.p.h. – not bad for a railroad whose main line was only 85.5 miles long. And, of course, this does not count the numerous turn-around locals and trains on the Mundelein branch. 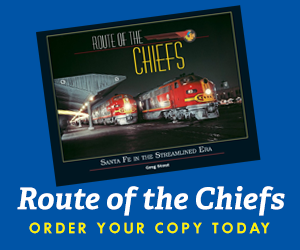 From Chicago and Milwaukee you had your choice of the hourly interurban cars or the five-trips-a-day Electroliners, the two articulated four-car streamliners built by St. Louis in 1941. 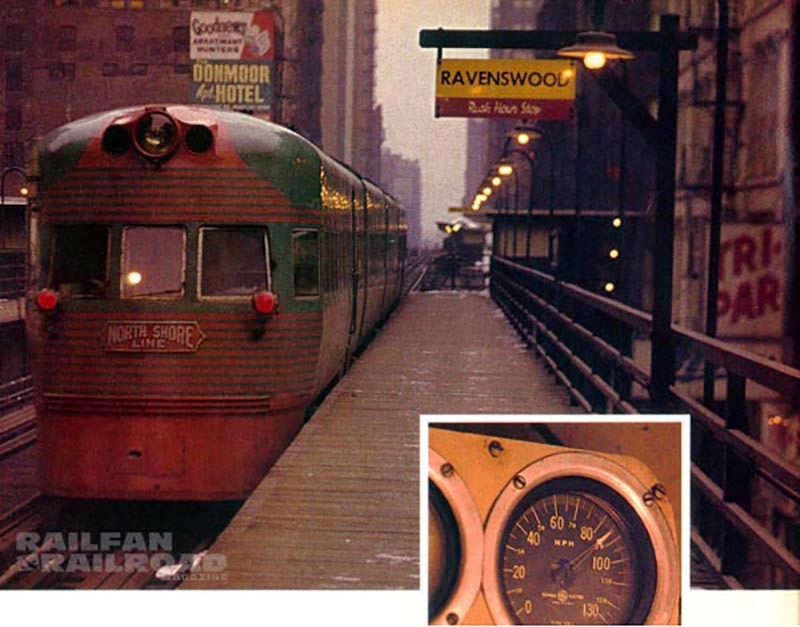 My favorite for getting home on weekends was the 2:00 o’clock afternoon Electroliner which would get me in less than two hours to the Wells & Madison elevated station in downtown Chicago, just a block from the All Nation Hobby Shop, where 1 could dally for a half hour before walking a few blocks west to North Western Station and the 5:00 p.m. C&NW Kate Shelly for Divan. Going either way, I never needed to concern myself timetable, for I could catch a North Shore train in the Chicago Loop on the hour any hour-and be in Milwaukee two hours later, or vice versa. The ride itself was as fascinating as one could imagine for a two-hour trip of less than 100 miles. For a northbound trip, you could clamber up to the down town elevated track, that gave Chicago’s “Loop” its enduring name and catch a train on Wabash Avenue at Congress, Adams, Madison or Randolph Streets. If you wanted to spend some time watching passenger trains out of Union Station, Grand Central, La Salle Street or Dearborn from the famous Roosevelt Road bridge, you could go to the handy North Shore station at the east end of the bridge and catch a train right out of that southernmost terminal. Although Roosevelt Road was the south end of the line, the North Shore’s main station on the Loop was in a building at 223 South Wabash. 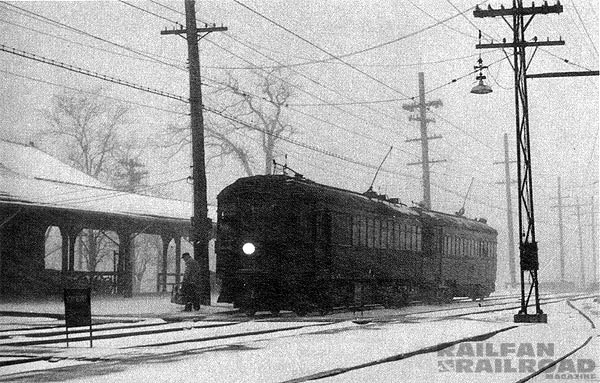 All of this time we would be running off outside third rail, but at Howard Street, on the north side of the city, we would head west and pick up the overhead trolley wire between East Prairie Road and the Crawford Avenue station in Skokie. Here was the North Shore’s moat amazing stunt. While yipping westward at about 40 m.p.h., the trainman would step between the cars and using the retriever rope raise the trolley pole to the wire at speed. They very seldom missed or had to slow down before the third rail ended. This was impressive to watch in daytime, but it was absolutely awesome at night in rain or snow! After rounding Oakton Curve, the train would be on the main line of the Skokie Valley Route, a “super” railroad built in the late 1920s to bypass the congested “Shore Line” between Evanston and Lake Bluff (the Shore Line, was abandoned in July 1955, with the eight-mile segment from North Chicago Junction south to the Highwood Shops retained for access to the railroad’s, main back shop). The 25-mile Skokie Valley line was famous for its straight, fast, double track its compound catenary on steel supports and its distinctive “Insull Spanish” depots. This was the raceway where the cars would be pegged at their balancing speed (between 72 and 86 m.p.h. depending on the car type, number of cars in the train and fine voltage, and the front doors would whistle with the wind through their cracks. Typical five-car train from 1942 timetable illustration. In an open grassland area at South Upton Junction, the double-track connection to the Mundelein Branch jogged off to the west and the main line curved to the east. As the trees and the community of Lake Bluff closed in, the Mundelein Branch/Lake Bluff Shore Line spur crossed at grade with moveable-point diamonds and then dropped down alongside the main. As you rounded the northward curve at Lake Bluff, you might catch a glimpse of the single Lake Bluff-Mundelein shuttle car at the station “down in the hole,” near the C&NW main line underpass. From Lake Bluff up through the Great Lakes Naval Training Station you would always be on the lookout for traffic on the C&NW main line which paralleled the North Shore to the east. 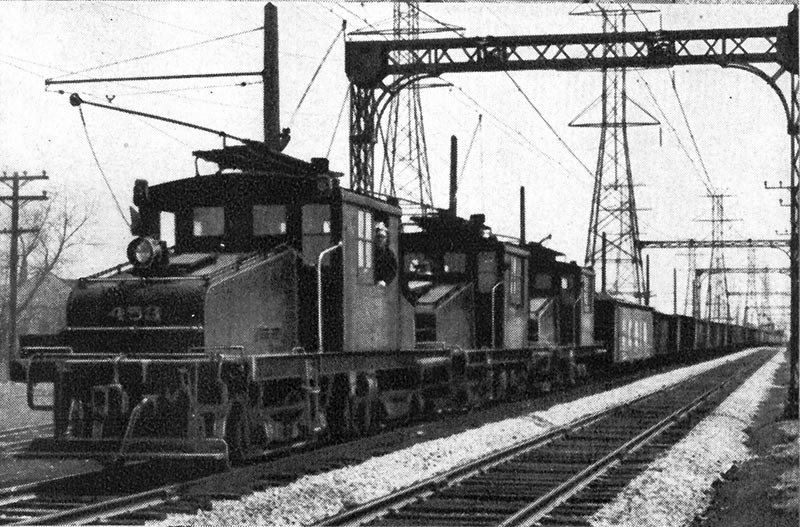 But your attention was also distracted to the west as the train passed Pettibone Yard, the freight facility where the two articulated freight motors, unusual battery steeple cabs and the quartet of GE steeple cab “pups” were kept. Things happened quickly as you passed through this area. Orange line car 606 would occasionally be seen waiting to enter the main line at the underpass where the old Shore Line ducked under the C&NW at North Chicago Junction. The old depot there was one of the more distinctive on the fine, with its wooden platforms wrapped against a sharp main line curve on a steep grade. North Chicago Junction was the “halfway point” on the railroad, and you would usually meet your southbound hourly counterpart at or near the depot. With the traction motors growling, your train would climb out of North Chicago Junction and return to “ground level” at Valley Junction, crossing the Elgin, Joliet & Eastern and accelerating northward on the arrow straight right-of-way through the suburban communities of North Chicago, Waukeegan and Zion, crossing into Wisconsin at State Line Road. In Kenosha you would fly right through the middle of the American Motors automobile plant of Nash Rambler fame, with the air horns blaring for the in-plant crosswalks. There was a lot of local industry around Kenosha, and it was a likely place to spot a freight motor out on the road. Such was also the case for Racine, a few miles further north. Beyond Racine, canted wooden poles and single trolley wire followed the straight double track up through the region of “mile” roads (Three Mile Road, Five Mile Road, Six Mile Road and Seven Mile Road) whose crossing, were protected by wig-wag signals or more modern gates. The two landmarks on this part of the railroad were the Root River bridge (almost unnoticeable from the train and difficult to photograph from below) and Ryan Tower, where the North Shore crossed the C&NW freight line at grade. Then it was over the “summit” of the railroad (elevation 730 feet) at College Avenue and down a beautiful sweeping curve on a .4% grade into the greater Milwaukee area in a long, wide cut. Just north of Bolivar Avenue the train would pass beneath a lightweight railroad girder bridge with a trolley wire above it. This was the old TMER&L “Milwaukee Electric” freight line connection from the Milwaukee Road to the Lakeside Power Plant at St. Francis — one of the last places in the country where two electric lines crossed one another with no connection (although the green “TM” steeple cabs were still working the power plant, by this time they rarely ventured west of the C&NW interchange at St. Francis). Leaving the cut for a fill, the North Shore crossed over the main line of the Milwaukee Road on an imposing skewed through truss bridge. Although the bridge itself was single track with spring switches for the double track at either end of it, the trolley wire went through the bridge uninterrupted, with the northbound and southbound main line wires brought close together side by-side. This permitted much higher speed operation than would have been possible with wire frogs and a single wire across the bridge. The high speed track came to an end on the high fill approaching Harrison Street yard and carbarn, the main servicing facility on the north end of the railroad. Off to the east and well below the fill, was the C&NW Chase roundhouse behind the North Share shop. At the depot just north of the shop, the North Shore interurban became a streetcar line, with its tracks running down the middle of 5th Street, in front of homes with tree-lined sidewalks. The trains would work their way 2.8 miles into the city, pausing for stoplights and passing through neighborhoods that progressed from residential to more and more commercial. A fragment of private right-of-way marked the one block zig-zag to the west the railroad made going from 5th to 6th Street at Madison. Then more street running through the increasingly-congested city traffic. At National Avenue the railroad trolley wires crossed two sets of trolleybus wires above the street. Then it was onto the long 6th Street viaduct over the Menomonee River and the Milwaukee Road freight and passenger mains into the North Shore terminal at Clybourn Street. The switches for the three platform tracks were in the brick-paved intersection of 6th and Clybourn, the single point turnouts were lined by a switchman with a point rod and a red flag who “lived” in a cozy shanty at the end of the platforms. A station sign “CREAM CITY” (Milwaukee’s nickname) adorned the end of the shanty. The Milwaukee Road’s impressive station with its clock tower and trussed trainshed could be seen a block away to the west. The North Shore terminal had three stub tracks at high level platforms. Servicing pits ran the length of these same platforms and made them seem twice as high as one would expect. Adding to the multi-level character of this midtown be facility were the two coach storage tracks just cast of the platforms in a deep “hole” adjacent to the old “Merchandise Dispatch” freight house. Even further downhill on the east side of that building were the lower yard team tracks. At the north end of the platforms was a handsome brick depot that would do justice to any prosperous railroad, complete with n lunch counter that exhibited an Electroliner painted on its mirror glass. The Hotel Schroeder, a couple of block, to the north, provided an canphatic visual abutment to the north end of the North Shore Line. I was fortunate enough to be able to explore tire North Shore Line ire both a passenger and railfan for about a year and a half before the ICC and corporate politics finally shut down the railroad on January 21, 1963. By selecting the North Shore as the subject of my second-year “photo thesis” for school, I was able to spend some time lineside during weekday, working on “official school business.” I was able to ride the Mundelein Branch shuttle from Lake Bluff and catch the freight action at Pettibone. It was one last chance to see the detailed workings of America’s last true interurban. 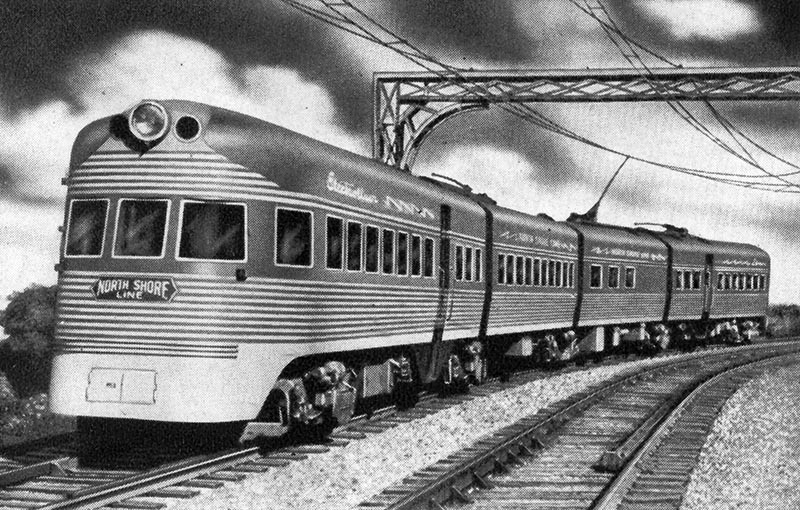 Electroliner illustration from 1942 timetable. While the North Shore Line no longer ran open platform parlor cars or named limiteds, it did have some hold-over amenities. Every Tuesday and Thursday, one of the Electroliner trainsets would spend the day in Harrison Street Shop for its weekly inspection and maintenance. On these days a “substitute ‘Liner” would take its place on the road: this would consist of three conventional coaches and the “Soup Wagon,” non-powered tavern -lounge/ dining car 415. While it was suite an experience to be sitting at an Electroliner tavern lounge table downing an “Electro-Burger” as the train sped past elevated station platforms loaded with harried commuters, it was even more remarkable in the big-windowed openness of the 415-and that unpowered diner really got bounced around at speed be tween the powered cars at either end of it. Other than the Electroliners and the 415, the North Shore was not much of an “equipment-spotter’s ” railroad to me at the time. There were combines, coaches and converted parlor cars in service, but I tended to overlook the differences, and simply consider them “North Shore cars.” Looking back now, I find the cars’ histories and bursae of considerably more interest than I did back in 1962. The North Shore roster reads like a Who’s Who of great interurban car builders. The big steel coaches were in essentially six series: Brill 150-164 (1915), Jewett 165-169 (1917), Cincinnati Car Co. 170-197 (1920), Cincinnati 700-733 (1923-1926), Pullman 737-751 (1928) and Standard 752-776 (1930). Combines 250-256 were part of the 1917 Jewett order, and the 734-736 “gap” in the coach numbers was filled with three rebuilt parlor cars. Add to this the St. Louis Car Co. Electroliners and the General Electric freight motors, and you had quite an impressive equipment history. In the early 1960, the North Shore care were in two different paint schemes: the “standard” green and red and the “Silverliner” red and gray. Between 1950 end 19.58, 28 of the 700series coaches, rebuilt diner 409, tavern/lounge/diner 415 and combine 251 received the Silverliner livery, which featured fake stainless steel fluting painted on the lower side panels using shaded gray striping (the effect was so convincing that people standing right next to them would often assume the fluting was three-dimensional). Though you would occasionally see matched consists, there appeared to be no concerted effort to keep the green cars or Silverliners together. The combines were used for baggage and newspaper service. There was a baggage terminal at Holden Court (Congress Street) on a spur of the el about a half mile north of the Roosevelt Road station. For the four daily trains in each direction that carried baggage, a combine would be placed at the north end of the train. 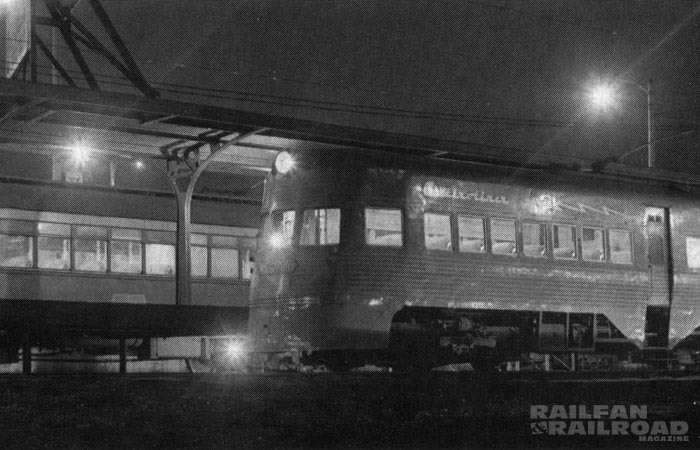 In Chicago, the combine would load baggage at Holden Court and then back down to Roosevelt Road just before departure time and couple onto the head end of the waiting coaches. There was a short baggage platform between tracks 2 and 3 in Milwaukee for access to the baggage doors of the combines. Typical freight train from 1942 timetable illustration. Freight service on the North Shore was based out of Pettibone Yard in North Chicago. Cars for NSL customers would be interchanged with the EJ&E at Rondout, the Soo at Mundelein, the Milwaukee Road at Racine and the C&NW at Skokie. With hourly limiteds, and numerous locals on line, the freights would really scamper between sidings to stay out of the way. Even in the early 1960s, there were still numerous freight customers at Skokie, along the Valley Line, around Waukegan, as far north as Racine, on the Mundelein branch and even on the north stub of the Shore Line. To handle this freight business the North Shore rostered four GE steeple cab “pups,” three of which were bought new in 1917 (452, 453) and 1923 (454) and one (457) bought second-hand in 1942 from the Arkansas Valley Interurban. To provide service to some of the industries along the Skokie Valley Line that had no wires over their plant trackage, the North Shore had two battery steeple cabs (455, 456) that would operate normally off the trolley wire but could venture out on battery power for up to five miles. Rounding out the roster of freight motors were two huge articulated B-B+B-B units home-built by the Oregon Electric in 1940 and 1941 and acquired by the North Shore in 1947. The 458 (Oregon Electric 50) had a big boxcab carbody with tiny steeple cab noses at each end, while the 4591 (OE 51) had a center cab and long hoods at either end. In spite of their drastically different appearances, both units were essentially the same mechanically. The North Shore used trolley poles on its freight motors, and a “trolley hop” would man the retriever ropes to guide the poles in back-up moves while switching. When the Oregon Electric motors would put their 1120 horsepower to work on a heavy road job, two trolley poles would be put up to handle the current draw. 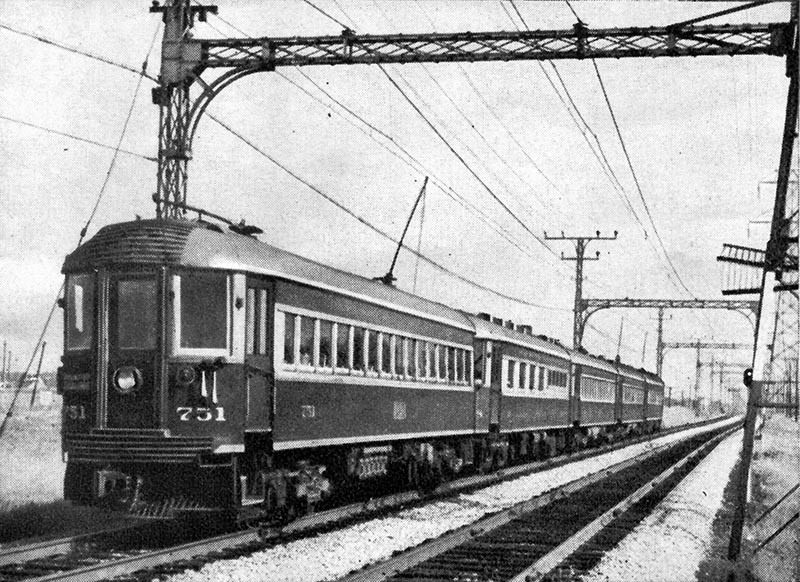 Although less-than-carload “Merchandise Dispatch” service had long since disappeared, the orange, wooden “MD” express cars could be seen in work train service at several points along the line. MD cars with pilot snow plows and sleet cutters were kept at Pettibone and Edison Court (Waukegan) for keeping the track and wires clear overnight in bad weather. The only MD car I ever saw moving under its own power, however, was one switching cars at the Highwood Shop. My only visit to Highwood was a few days before the railroad was to shut down, but the shop was continuing major overhaul and interior work on about a dozen cars just as though they would ran forever. It was a very strange encounter, to say the least. I did not witness an actual North Shore Line last run. The weekend of January 21, 1963, when it was to shut down, found me with a freelance photography job back home in Dixon to cover. My last ride was Thursday, January 18, on the 2:00 o’clock Electroliner (803-804) out of Milwaukee. As the photos here show, we hit 86 m.p.h. on the southbound trip, and I detrained, as usual, at Wells and Madison, taking one last photo of the departing ‘Liner before heading for All-Nation Hobby Shop and North Western Station. I returned Sunday on the CB&Q and Milwaukee Road. I remember it was a nuisance to have to find a convenient schedule between the C&NW and Milwaukee Road trains. While I was gone, the North Shore officially shut down with the arrival of Train 437 in Milwaukee at 2:55 a.m. on Sunday, January 21, 1963. Of course, the railroad didn’t shut down that instant. 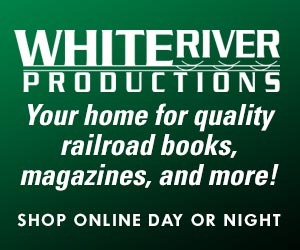 The railroad had not “wound down” its service, and on the last day, Saturday, January 20, it had run a full schedule of trains. Over the next few days the equipment was moved into storage and secured. I regret that I made no note of the exact day and date, but one day in that next week I went out to Harrison Street Shop and was surprised to see senior inspector Orin Schmidt still in the office. We talked for a while, and he made his rounds securing the building. He said that he was the last North Shore Line employee still working on the railroad, but that when he locked up at 11:00 p.m. it would be shut down forever. The next people to open a door would be the scrappers. I walked out that door with him and watched the railroad die without fanfare. I still do not remember the date. Since that cold January night in 1963 I have made it a point to avoid the corpse of the North Shore Line. I never went back to see the track torn up, and I have never ridden the CTA’s “Skokie Swift” service on the stub from Howard Street up to Skokie. Though I did ride and photograph the Electroliners when they were reincarnated on the Red Arrow Line in Philadelphia, I essentially walked away from the North Shore Line with my mental images intact. In my memory, the North Shore remains unchanged after 25 years. 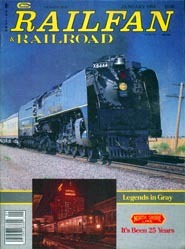 This article originally appeared in the January 1988 issue of Railfan & Railroad.